The protest movement of the ‘gilets jaunes’ (yellow vests) tax fuel demonstrators landed in Brussels, Belgium today where they protested in the Rue de La Loi, the main street between the EU Commission buildings and the Belgian Parliament. If the tensions shown in Brussels today are anything to predict how tomorrow in Paris will turn out (where another mass demonstration is planned), the French government better get ready as several police vehicles were lit, police had to react with tear gas and water cannons and protesters threw rocks at them. The yellow vests wanted to gather at 13 o'clock in the Parc du Cinquantenaire and tried to get to the Rue de la Loi, the centre of Brussels from different sides, but the police had already closed off all the roads towards there as they didn’t want to see images or rioting near the EU Commission building. Related coverage: France - Macron Shock Refusal To Change New Fuel Taxes. The attendees kept on chanting slogans. Some called for the resignation of Prime Minister Charles Michel (MR), while other attendees just urged consultations with the head of government. The actions actually started a little before 11 o'clock. The exit of the tunnels were blocked with the help of material from a nearby construction site and the activists went to the crossroads to occupy the streets from there. A number of demonstrators also ran into the tunnels to stop traffic there and throw smoke bombs. Since then, a sort of cat-and-mouse game has been going on: the tunnels have already been occupied several times, only to be released again, and to be closed again. A large group also started to walk around in the city without having a clear destination. There seemed to be no question of a predetermined route. At the Lambermont, the official residence of Belgian Prime Minister Charles Michel, it came to a first confrontation between the yellow vests and the riot police shortly after noon. Objects were thrown at the police, who used water cannons in return. After the first escalation came new confrontations between the riot police and the demonstrators. The police used tear gas to drive the crowd away. The yellow vests threw fences and building materials from a construction site on the street, in the middle of the cars. 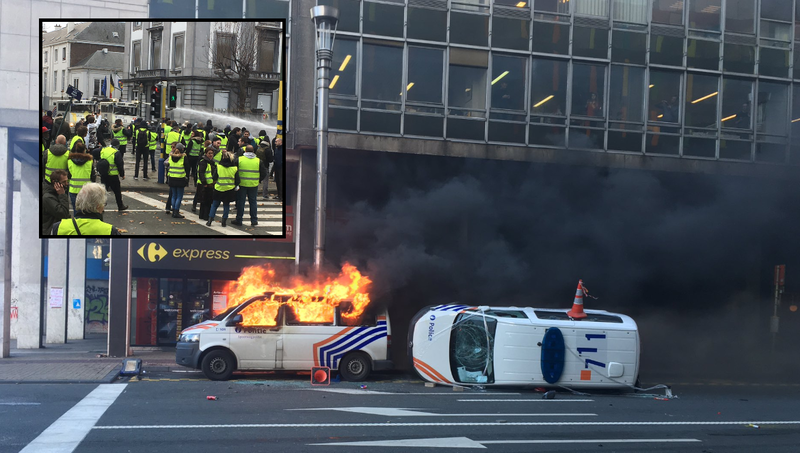 The violence seen in Brussels again today does not bode well for France tomorrow, where another major protest is planned against the planned fuel tax increases of the President Macron government. HE is rocking the nations. The party is over, peoples. People of Paris have had more than enough of the Government twisting their arms! I say good for them, send the EU to hell! We need another French revolution to topple this communist regime.Maybe the French people will bring out the guillotine again and remove the fake prime minister Charles Michel. If they have any backbone. The world is on the brink. Viva la France, people have had enough of the draconian dictates of these elites. Elections must be held, fair and verifiable, that the people can be assured are fair. they must have a voice. No more free entree into any country by criminals. This is a lesson that all free people must work at democracy.